Nine days out of ten, I love this little blog of mine. Actually probably more often than that. I'd say about 99.9% of the time, this whole blogging thing is great, and wonderful, and I can't get enough of it. But then there's the other times. The 0.01%. The times when I don't have anything to write about. Or worse, when I do have something to write about, but I can't. There are plenty of people that read my blog: my parents (or at least my mom), my boyfriend (occasionally), friends, my ex, people from high school, and of course all of you lovely ladies (and gents) that I've never even met but grown so close to. But what about when I want to write about something going on with my best friend, something that I wouldn't necessarily want her/him to read? What if I wanted to discuss something on here that I wouldn't be comfortable with my parents or grandparents reading? Or seek advice from a situation that a loved one wouldn't want me to share? Sometimes a little anonymity would be nice. 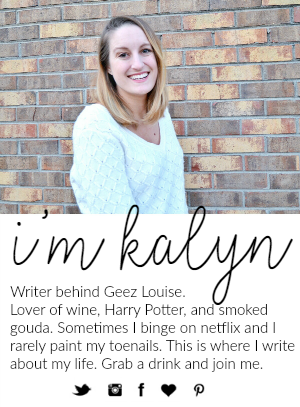 To have the ability to write whatever the hell I wanted without getting a phone call or text saying "So I read on your blog today..." which would subsequently lead to me having to explain myself to someone. I enjoy blogging more than I ever thought I would, it has brought me closer to to some great ladies and introduced me to a community and a way of life that I never knew could exist from simply having an "online diary" (as I've heard it called). I think of my blog as so much more than a "diary." It is a place where I can come to seek advice, share experiences, make people laugh, and document big events. It is a place where I can scroll through my archives and laugh at my first posts or cry at my sad posts. I can come here to read my favorite blogs and email some new friends. 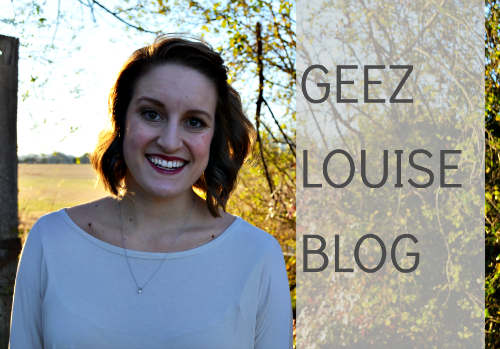 Blogging is an outlet, an escape, and now something I couldn't imagine my life without. As with anything in life, there are pros and cons to blogging. I've never really delt with any of the cons (besides the occasional writers block) but today I am. Today I'm not staring at a blank page with no words. Today I'm staring at a blank page with too many words in my head. Words that I can't share without the chance of hurting someone's feelings. eep, that's tough. only a few people i know know about my blog but i keep it quiet. i used to tweet my posts but then more friends joined twitter so i stopped doing that. same with facebook. i prefer to have the blog as something that it MINE; my own thoughts where i can write freely and without borders. is there a way to lock your posts from public viewers? UGH. There is SO much I want to write about on my blog, especially lately, but can't for this very reason. But I guess it's a trade off to being able to share what we write with those we love. I was thinking a lot about anonymity with blogging recently, as a co-workers who's heard me talk about my blog a bunch of times was asking if she could read it. I'm not opposed to letter her read it, per se, but I write a lot of crap about our job, and I'd hate for her to have this knowledge and blab about it (intentionally or not). Since then I've been censoring myself a lot more than I was before. And I agree with you - it's not fun. I wish had some sort of answer for us all! Yep yep yep. Couldn't agree more! My mom reads my blog (that was my mistake) and she tells EVERYONE!! Like her friends and my family. So now I know her friends, my aunts, cousins, all read it. 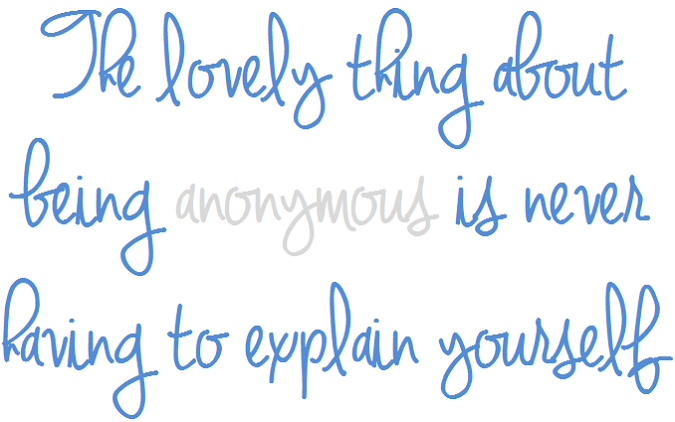 I would feel totally comfortable talking about more personal things if they didn't. It is still awkward when my mom starts a conversation with, "So I read on your blog..."
I'm with you on that one. My mom reads my blog all the time! Then she'll comment on something I wrote later on and I'll be like, "Do we have to talk about this?" Bleh, it just makes me uncomfortable. I can't imagine my EX reading my blog though! That would just be too strange for me! asics in france Chacun doit attendre air jordan 5 pre grape en moyenne 30 minutes avant de pouvoir payer pour ce qu'il a acheté. bonnet nike sb rouge Les meilleurs taux des articles de tenues de Bapes chaussure adidas zx flux pas cher sont disponibles sur le net et certains offrent également l'expédition nike free run flyknit avis exprès libre surtout si vous placez votre get air jordan concord femme aujourd'hui. Les espadrilles ont présenté un style innovateur, des arrangements créateurs, air jordan 1 mid bordeaux et quelques nouvelles capacités qui manquaient les espadrilles précédentes de coque iphone 6 nike sb Jordan.